Finding the perfect Bridesmaids Dress to ensure your maids radiate on your wedding day often comes second only to the hunt for your dream wedding gown. Lace, sparkle, modern, classic.. there are so many styles, colours and shapes to choose from! In our top 10 bridesmaid dress trends for 2019 we explore colour palettes, what real bridesmaids are purchasing and what’s hot on the runway. Catering to different body shapes and tastes is always a challenge when choosing gowns for your bridesmaids. Mix and matching gowns in the same colour allows for self expression and variety. We offer gowns of different styles in the same fabric to help ensure your maids are coordinated, while maintaining their individuality. Get in touch to find out which styles work best together! Shown above, the LIBBY and LUCIA bridesmaid gowns. Halter bridesmaid gowns deliver a touch of demure sophistication. The Tania Olsen SYLVIA and CASSIDY gowns (above) maintain elegance while introducing off shoulder and cut out back features. Both of these gowns are coming soon as part of a new Autumn/ Winter range… stay tuned. 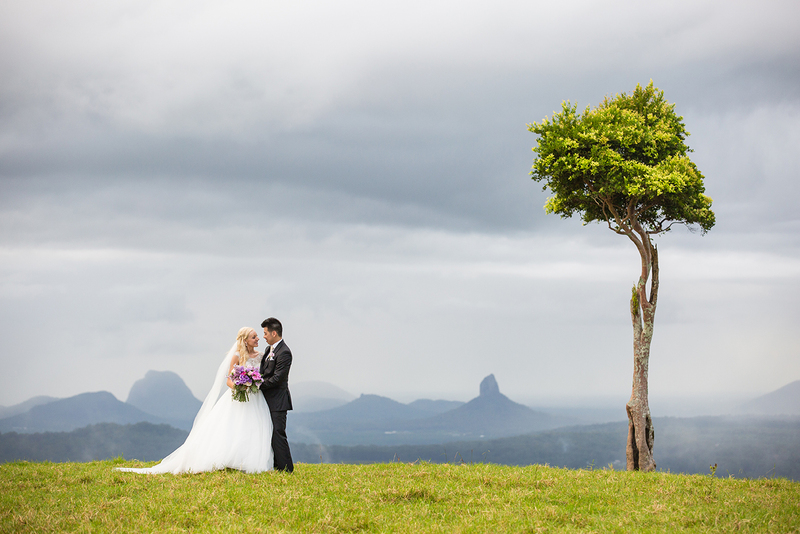 Lace is a classic, whimsical fabric that will bring understated elegance to your bridal party. Consider a classic lace trim gown with v-back and flowing georgette skirt such as the Tania Olsen TALIYAH shown above left, or the long-sleeved VALLARIS bridesmaid gown – above right. Channel your finest Grecian goddess in a one shoulder gown. Year on year one of our most popular bridesmaid styles, above left is the new stretch tulle SABRINA gown (coming soon) and ELOISE in blush on the right. Nothing is more versatile than a wrap dress and we are pleased to offer three variations on this style of gown. The PETRA pant suit (above left) and ETERNITY gown above right, are the newest evolutions of this look. Use the long straps to wrap each of these gowns your way, ensuring you find the ultimate expression to suit your event and body shape. View some of the looks achievable in our CLASSIC WRAP DRESS. Something that has traditionally been an absolute no-no for weddings, white bridesmaids dresses are becoming increasingly more popular. Find a style very different from your own gown, but in a complimentary shade, then have fun with colourful floral arrangements to provide some pop to your party! Shown above, the CLAIRE and ELOISE bridesmaid dresses in white. Pantone’s warm, spirited colour of 2019 ‘Living Coral’ may be a little bright for your bridesmaids, but complimentary hues from the accompanying Pantone UNDER THE SEA colour palette provide some beautiful inspiration. Shown above, the Tania Olsen LIANA GOWN in Teal. This soft, feminine tone doesn’t look to be going anywhere this season, and for good reason! Complimentary to most skin tones and easy to coordinate, a light pink hue is romantic and versatile – a bridesmaid classic. Slightly shorter, more casual gowns can soften your bridal party, providing a contemporary look for a location wedding. The KELLY cocktail dress above left features a high cross over neck and slightly wrapped skirt, while the BRIT bridesmaid gown on the right (coming soon) is a delicate dress of crepe. Draw the eye upwards to accentuate beautifully sculpted shoulders. Find gowns that draw in at the waist to define shape such as the ARIANNA GOWN above left or the lace and soft jersey knit JAQULYN above right. 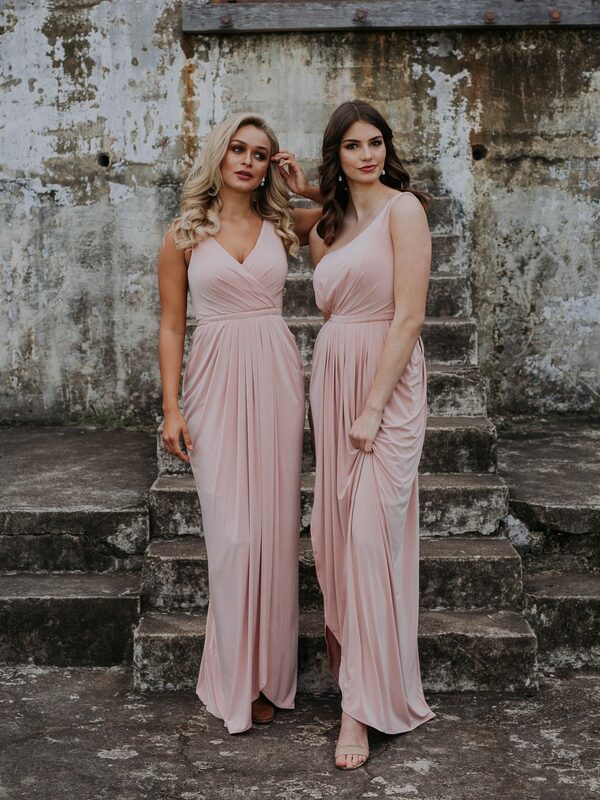 Shop a huge range of bridesmaid dresses online or in-store at Sentani. We specialise in innovate and creative styling for your special day, so please don’t hesitate to get in touch if we can help.